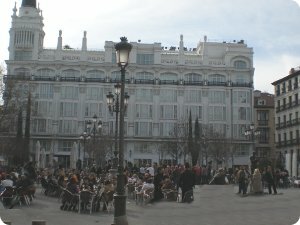 The Santa Ana Square itself is located just a short walk from both the Plaza Mayor and the Puerta del Sol. It is also possible to walk to Madrid's main museums from here, making this area an ideal location to stay in the city. The square was originally the site of the Convent of Santa Ana, founded in 1586 but demolished during the reign of José I Bonaparte (Napoleon's brother), in 1810. In its place, the Square was created around 1848. The German Brewery, built in 1904, still serves beer in steins. Ernest Hemingway did drink here during his stays in Madrid, and the old place is still much as it was then. The Villa Rosa, built in 1930, an elegant yet hopping flamenco club that retains a great Andalusian tile decoration and Moorish arches. The famous and centennial cafe La Suiza. The Naturbier Brewery, with 100% natural beers. On its east side, the Spanish Theater ("Teatro Español") may be found, whose origins go back to 1583, although it was rebuilt in 1807 due to a fire. 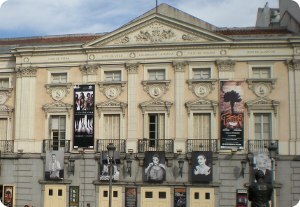 In this theatre Spain's most important writers have seen their works acted out on stage. To the west, the Reina Victoria hotel dominates the square. The luxury hotel was built in 1916, the large front windows of its rooms enjoying truly spectacular views of the Plaza. Two statues in the square play tribute to two great Spanish personalities: Calderón de la Barca (famous spanish playwright) and Federico García Lorca (famous poet dramatist). * Line 1 - Antón Martín station. * Line 2 - Sol station.